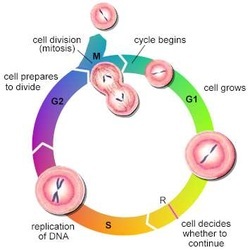 When a cell divides it produces 2 daughter cells. Coolidge-Stoltz, Elizabeth. Focus on California Life Science. Boston, MA: Pearson Prentice Hall, 2008. When daughter cells are formed they are given the same amount of chromosomes. If the process is disturbed the daughter cells will receive an unequal amount of chromosomes which makes cancer in the cell possible. Most cells in our bodies contain 23 pairs of chromosomes that encode our individual genetic identities. In fact, aggressive human tumors are frequently composed of cells with an abnormal amount of chromosomes. 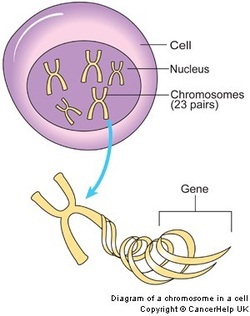 Key Element of Cell Division: How Daughter Cells Receive the Same Number of Chromosomes." Science Daily: News & Articles in Science, Health, Environment & Technology. Web. 30 Nov. 2011. What Is a Daughter Cell." The Q&A Wiki. Web. 09 Dec. 2011. <http://wiki.answers.com/Q/What_is_a_daughter_cell>. Cell Division." Wikipedia, the Free Encyclopedia. Web. 05 Dec. 2011.